When it comes to tarot cards, a tarot reading is more than just knowing what each card means. It is important to understand each card as well as each card spread. It is also important to learn how to trust your instincts when giving a tarot reading. With a little patience and proper steps, you will be able to give free tarot card readings online or offline! Before you give your first reading, knowing your tarot deck is the most important step. This will give you a better understanding of your cards and help you feel more comfortable with your deck. You need to understand each card and how they relate to each other. If you are unprepared with your cards, you are never able to release an accurate tarot reading. Take extra time to become as familiar with a new deck as possible before using it to conduct a tarot reading online. There are several different ways to shuffle the cards during a free online tarot card reading. At first, the one who is getting the reading will touch the cards. However, some Tarot readers do not want anyone touching their cards. But if you allow the seekers to shuffle your cards, you are allowing them to concentrate on their question. By staying focused while shuffling, the seekers are transferring their energy onto the cards. There is also another way of cutting the deck, which means the seekers cut the deck three times with their left hand before giving the cards back to the reader. Depending on which reading you are doing, there are various patterns of Tarot spreads. Each spread is used to interpret a certain reading. Each card is placed in a typical position that will relate to the other cards in the spread and help complete the reading. It is important to choose a spread that relates to the question being asked by the seeker. This will help you answer any question they have and perform an accurate session. It is possible to come up with your own method and spread to work better in uncommon situations. By this way, you are capable of giving a more accurate reading for certain individuals. Practice makes perfect so make sure you practice these steps as often as possible. Let the art of reading Tarot cards become natural to you. If you cannot practice with someone face-to-face, you can practice by giving a tarot reading online using Facebook or Skype or offering free tarot card readings. 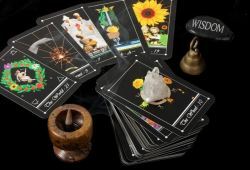 Hopefully, the simple steps above will help you become a skilled tarot reader who excels at giving both online readings and face-to-face readings. Do not mind studying to find out the best method for yourself. You should integrate these steps into your normal ritual and practice. As a result, when these steps are second instinct, you will be able to give an accurate tarot reading online whenever called upon!